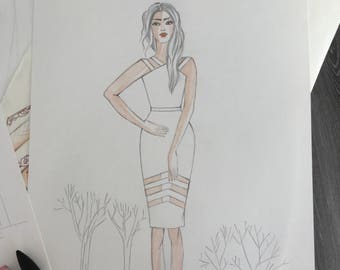 This dress can be made to order in a range of standard sizes or made to measure.This dress can be made to order in a range of standard sizes (XXS,XS,S,M,L,XL) or made to measure. Please write to me and I will provide a list of the measurements we require and a measurement guide. This dress will be cut and sewn at our atelier in Tbilisi or Kiev. We do everything possible to create the perfect cut and to make every seam and stitch as neat as we can. Absolutely beautiful! Lubov was so lovely, great customer service! Thank you so much to Lubov who patiently helped me customize my wedding veil! It is exactly what I was hoping it to be. She is incredibly easy to work with, and was quick at responding to all of my questions. The veil arrived to Canada faster than I expected. I will definitely be recommending her shop to my friends and family. Thank you again! Awesome quality package very well! 2) SWIFT (IBAN) transfer. In this case we provide discount 12% for our products and shipping costs. (if you will be interesting in paying in this kind please let me know about this, because I will need to add new listing for you). In case of return client should pay delivery cost by himself. To initiate a return, please send an email to apilatik@gmail.com listing your Name, Order Number, and items code you would like to return and specifying the reason you are returning the product: if you prefer a refunding or if you prefer to exchange the size/colour of the same article purchased, if available. A customer service member will reply within 48 hours,except for the week-end and festive closures, with a Return Authorization Number and the instructions on how to proceed. Please be informed that the shipment costs to send back goods are AT YOUR CHARGE. You can choose the courier you prefer. It is not necessary to use DHL, but for your security we advice choosing a courier or a post service that consents to YOU the tracking and the return receipt of your shipment. ACreativeAtelier does not take on the responsibility of your return shipment. For product EXCHANGES ACreativeAtelier will waive shipping charges on your re-order. Important: in case of exchange, please be informed that we will not accept returns of purchased items that have been previously returned. ATTENTION: In case of refund we can send back you the price of item minus 15%. Usually we make our dresses according measurements of our client. We do everything possible the dress fits to your body. As your dress is made especially for you and to your sizing and height we cannot offer returns, but this has never been a problem. We can post fabric swatches and also provide further images when requested- we are here to help you as much as we can and understand that purchasing your wedding dress is very important, but our dresses will not disappoint as they are even more beautiful in real life! All items undergo high-grade professional quality control to ensure fabrics and manufacturing is of the highest standard. In case of a manufacturing fault items can be returned for a replacement/repair. Please contact us to know shipping time (standard or express) to your city.